The Manteo WayAt Manteo High School, our students and staff are committed to doing their best each day. We value excellence in all that we do. Contact UsLooking for someone? Use our Faculty and Staff Directory to search for contact information for all of our staff and school leaders. Our Curriculum Focus At Manteo High School, we believe that each minute of the school day is important. Our teachers put a focus on instruction and they work to ensure that all of our students are successful. ResourcesAre you looking for resources to help support your child's educational goals? Check out this list of helpful resources and feel free to contact us with any questions! Join our TeamAre you interested in playing sports at Manteo High School? Our teams have been state and nationally recognized. Learn more information here. Meet the PlayersAt Manteo High School, our players are student-athletes and academic achievement comes first. We work hard and play hard. Learn more here. Student EngagementAre you looking for opportunities for your child to enrich their educational experience? Learn more about the exciting activities at Manteo High School. SupportOur professional guidance counselors and staff are here to support you and your child! Our goal is for your child to be successful. Learn more about the resources that we provide. College Resources Preparing for college can be stressful. The counseling staff at Manteo High School is here to help! Check out these helpful resources. Support Contact our guidance counselors with any questions that you might have. Get Involved! We invite all of our parents to join our Parent Teacher Organization and support our school. Learn more here. Looking for Information?Check out our parent portal to access information for a variety of topics, including: bus forms, lunch menus, and enrollment materials. Your web browser does not support the <video> tag. Learn more about the prestigious awards that have been presented to Manteo High School, Manteo Elementary School and Kitty Hawk Elementary School! Dare County Schools is excited to offer parents the option of enrolling their rising kindergarten and first-grade students in a Spanish Dual Language classroom. Dare County Schools was ranked in the top 5 public school districts in North Carolina by a 2017 report from the Public School Forum. View the full report here. Cape Hatteras Secondary School offers students an exciting opportunity to partner with a local Coastal Studies Institute to learn more about the rich ecosystems on the Outer Banks. Students in Dare County Schools graduate at significantly higher rates than other districts in North Carolina. All schools in Dare County meet or exceed growth each year. 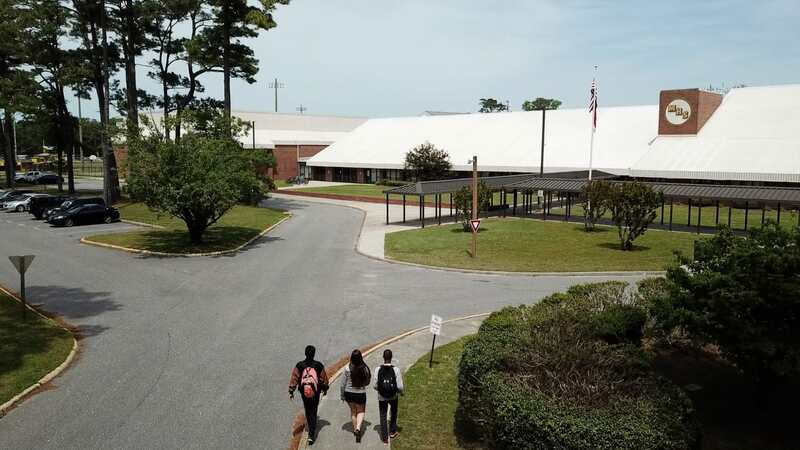 Manteo High School is one of the few schools in North Carolina to receive a school grade of A+. Dare County Schools is one of the few public school districts in the nation to have a public education foundation. Learn how the foundation supports our students. Our high schools are nationally recognized for high SAT scores and high college acceptance rates. See what the data says. Teachers that work for Dare County Schools have the option of living in one of our teacher housing apartment complexes. This is just one of the many advantages of working in Dare County Schools! Learn More About Teacher Housing.